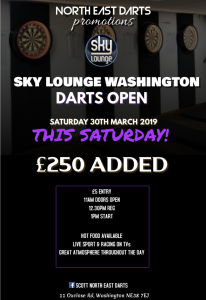 Sky Lounge Darts Open this Saturday! This Saturday at Sky Lounge Washington! A fantastic raised darts area with Live Sport & Racing on many TVs throughout the venue. Drinks deals and hot food available all day along with a great atmosphere!